Solid Time Magazine cover story by Barbara Kiviat titled "The Workforce: Where Will the New Jobs Come From?". All about the economy and how eventual real growth will have to be in the form of newly created jobs (and job categories), I particularly found of note the ending of the piece (below) and what it make me consider. "If the key characteristics of the American economy are flexibility and forward motion, then we would all be better off if people felt more support — both financial and social — to invest in their education, switch jobs and industries and venture out to start new firms. Establishing job creation as a discrete goal is a misleading enterprise. Beyond cyclic swings in demand, what we're really talking about creating is not jobs but ideas and technologies and more efficient ways of producing and selling goods and services." Of this list, hard work and ability should (hopefully) be required things (but, sadly... aren't always). Knowing what you want to do and actually doing it is hugely important because for many, that doesn't describe their work situation. When you hear stories about people who came up from the bottom floor of something, they in many cases were fortunate enough to know early on that thing was what they wanted, so they could start working on it early in their career when most everyone is on the bottom floor. Where it gets tougher (but, not impossible) is for people who don't know early on what they want to do... and don't have the same flexibility to start at the bottom of a field. The fourth one is just as it's written... being in the right place at the right time is where many people have that big leap forward in their careers. If you combine effort and ability towards a goal that really matters to you, that right place at right time break "should" eventually come. This is where the fifth career ingredient comes into play. There's a lot of different types of companies and work opportunities out there. Many of them are going to reward the first two, have the types of positions that let people let people who know their area of interest work in it and then have those chance to shine and advance... but, not all. So, to tie back full circle to the Kiviat piece and quoted section at the end of it... I agree completely with her statement about people being willing to take career leaps, whether those be at a job role, company or industry level. Working hard and becoming proficient at something is all good and well, but it should be at an activity that someone wants to do and in a place that provides rewards and opportunities to move forward. Can be scary to move out of something comfortable that doesn't allow for this, but sometimes... it's just plain needed. Excellent piece from this week's Sports Illustrated on the NCAA Basketball Tournament. From Tim Layden, "High Stakes" is all about March Madness and the ramifications of what can happen out of the tournament... with reference to some great past storylines in Bryce Drew and Valparaiso from 1998 and George Mason 2006. For me personally, though, I think of Tyus Edney going coast to coast to win an early round game en route to a UCLA Championship and the #16 seed Princeton Tigers almost taking down Georgetown in a first round matchup. In the not quite as amazing, but still memorable category were the games I saw this last weekend with Michigan State taking down Maryland at the buzzer and Northern Iowa beating #1 seed Kansas. One great thing about the tournament is each memorable game can stand on it's own as exciting, but then you never know what will follow and just how much that win can mean... i.e. UCLA wouldn't have advanced out of the early rounds to later win the title if not for that Tyus Edney bucket. Even if someone's not a huge basketball fan, it's compelling writing from Layden about something with a lot of human drama. Three articles of note I found in the latest issue of BusinessWeek... all with a common theme that I'll call hubris about money. The most interesting was the last I came across... a review of the new Michael Lewis book "The Big Short". Being a fan of the handful of Lewis books I've read (most recent reviewed here), I'm always curious about new stuff by him and based on the BW review, this sounds fascinating. The idea is a chronicling of several individuals who made boatloads of money predicting the real estate crash of 1998. Specifically, they shorted some of the high-risk mortgage securities out there and flew in the face of conventional wisdom at the time... which assumed everyone would continue getting rich forever off real estate. It certainly didn't help me at the time (since I still bought a house at the 2005 peak of the market), but I recall thinking about what would happen if home values actually were to go down... and be down when people's exotic low fixed rate loans adjusted to significantly higher conventional loans. Well, these guys did think about that and made themselves rich from it. I'll now have to actually read the book to say any more, but the review itself is an indicator that it should be good. In the same category of books and people assuming perpetual riches was an excerpt from the Harry Markopolos book "No One Would Listen". All about the author's experiences with those close to and making money (or so they thought) in Bernard Madoff's Ponzi scheme, it's pretty compelling reading. Even if it didn't make sense upon examination, people wouldn't question the source of money that they thought Madoff was making them. Finally from this issue was the short piece "Can Manchester United Kick Its Debt Habit?" Simple summary would be... rich guys thought they'd get richer by borrowing huge sums of money and then began to get crushed under the debt payments. Hmmm... seems to relate a bit to the other two articles linked to here, doesn't it? Recently finished "White Fang" by Jack London and found it to be a good read. Having previously used the "Classics" app on my iPhone to read "Call of the Wild" by London (which I reviewed here), I used the Amazon Kindle Reader app on my phone to read this one. Really didn't see much difference at all in the user interface or experience with the Kindle Reader app as opposed to Classics... both solid. Following up on the heels of my blog post on tags or labels noted, I wanted to create a new label category for posts with an "author website" linked to within. This certainly doesn't mean that each site will be tremendously interesting as I know at least a few are there just to help sell the book and don't have much else on or from the author. On the flip side... I know there's also at least a few that have lots of content from the writer and should make for compelling reading. Excellent cover story from the Mar 15 issue of Time Magazine. Titled "How Tom Hanks Became America's Historian in Chief" the story is about... that. Really interesting stuff detailing Hanks' big and small screen ventures about our nation's history with "The Pacific" starting Mar 14 on HBO following on the heels of: "Saving Private Ryan", "Bank of Brothers", "John Adams", "Apollo 13" and "Charlie Wilson's War". The article itself is an interesting read as Hanks speaks of some of his more well liked historical writers such as Doris Kearns Goodwin, Stephen Ambrose and David McCullough. One other piece of the story I found interesting was mention of Hanks obtaining the rights to the Vincent Bugliosi book "Reclaiming History: The Assassination of President John F. Kennedy". From the prosecutor of Charles Manson, it's a debunking of the various conspiracy theories surrounding Lee Harvey Oswald and whether he acted alone. You've got hockey starting to get really interesting leading into the NHL playoffs and MLB Spring Training has officially sprung. The time two months from now with baseball past it's "playing in the snow" phase and hockey fully into the Stanley Cup playoffs is great as well, but what this current time has is... anticipation. The second piece was from CNNSI and by Joe Posnanski... he of the frequently written to Joe Blog. Titled "Chapman justifies hype in debut", it's about Cincinnati Reds lefty Aroldis Chapman, but more than that... it's about this same idea of how every Spring, each team has an equal shot at glory that year. Even beyond that, Chapman represents the idea of a previously unknown talent stepping up in the Spring to show would could be possible. Maybe Chapman will wind up in the Hall of Fame, maybe he won't and maybe the Reds will win a pennant (more than likely not), but for sports fans who love the great and unexpected story, it's fun to think about. Some pretty interesting stuff from the Mar 15 issue of BusinessWeek... much of it around a common theme. The first story that struck me as interesting was "What I Learned from My Dad"... a commentary by Peter Buffett following the much larger profile of his uber-investor father, Warren Buffett. The piece is actually excerpted from his forthcoming book "Life Is What You Make It: Find Your Own Path to Fulfillment" and tells the interesting tale of how the younger Buffett was staked with a roughly $90K inheritance at age 21... and used the money to fund making a go of it in the music field he loved. Immediately following that in this BW issue was "And Google Begat..." about the Angel investing (no, not these kind of Angels) done by current and former Googlers. Pretty interesting stuff about the "next generation" impact Google wealth is having by helping fund tech startups such as Twitter, Tesla Motors and a host of smaller unknown (but, probably not always) ventures. The story was also noteworthy to me with mention of Truckee, CA based ex-Google guy Chris Sacca (his blog here). Granted, the town is what I noticed, but it was cool to read how Sacca came across one of his investments after posting a message on his Twitter account one Friday night asking if any startups were working late. Finally, from this issue I liked "The Road to Reinvention" about career changes following personal setbacks. Specifically the one that got me (out of three vignettes) was that about Todd Morris... a 30 something tech sales guy who had an interest in a product category (security and surveillance gadgets), didn't see anyone dominating the field and up and created a now successful company, BrickHouse Security) in that space. Gotta be something to that idea of building a business around something you think valuable, but not already out there. Three stories... one theme. Two guesses... that's right, building a career/investing in a business around something that interests you. Solid. 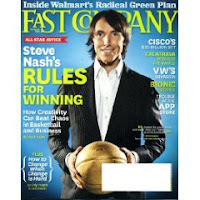 The first was from the cover story on Phoenix Suns point guard Steve Nash. Rather than the entirety of the story, what struck me was mention around his off the court involvements. One of Nash's business ventures is a film production company, Meathawk, and it's first documentary is an ESPN 30 for 30 project on Canadian hero Terry Fox. The movie is titled "Into the Wind" and will chronicle the run across Canada that Fox made to raise money for cancer research after losing a leg to the disease. While Fox passed away in 1981, his legend has carried on to the point that his mother was a featured participant of the Vancouver 2010 Winter Olympics Opening Ceremonies. No ESPN air date yet for the documentary, but I'm looking forward to seeing it. Looking into details on "Into the Wind" led me to read further about the 30 for 30 documentary project. The main website features this Bill Simmons essay on 30 for 30 along with a listing of the features. Among these is "Kings Ransom" about Wayne Gretzky going from the Edmonton Oilers to the LA Kings. Directed by Peter Berg, this movie aired fall 2009 on ESPN and appears to be shown next April 25 on ESPN Classic. Completely unrelated to Steve Nash, Terry Fox, ESPN or Wayne Gretzky... I also found of note from this Fast Company issue mention of the "weblog about the liberal arts 2.0" Kottke.org from blogger Jason Kottke. In what has now being an annual event, BusinessWeek in the Mar 1 issued published their "Special Report on Customer Service". Within the report, there's a feature on the typically highly ranked and 2010 #2 for Customer Service company USAA.